RTP, NC: AgBiome is looking for a M.S./Ph.D. formulation scientist. Non-profit process development? : About once or twice a year, there's a position like this one from the International Partnership for Microbicides; they're looking for an associate director of process chemistry to oversee CMO work on their commercial projects. Seems like that would be an interesting place for someone who had lots of pharma experience, and wanted to apply it to a different sector. Kennesaw, GA: Deerland Enzymes, Inc. is a leading specialty formulator and contract manufacturer of enzyme-based dietary supplements. They're looking for a M.S./Ph.D. research and development manager. A broader look: Monster, Careerbuilder, Indeed and USAjobs.gov show (respectively) "1000+", 415, 9004 and 25 positions for the search term "chemist." LinkedIn shows 2,174 positions for the job title "chemist", with 197 for "analytical chemist", 43 for "organic chemist", 31 for "research chemist", 33 for "medicinal chemist" and 7 for "synthetic chemist." Beautiful Edmonton: Fair number of positions at Gilead in Edmonton in process development. Pearl River, NY: I see Pfizer is hiring a Ph.D. analytical chemist to do nanoparticle/ADC research. "Dow Announces Actions To Pee On Your Leg, Tell You It's Raining"
As a result of the Company’s global workforce reduction targets announced today, approximately 700 roles in the GLBR will be eliminated from the combined companies. These reductions will come from both Dow and Dow Corning, and are part of Dow’s overall cost reduction efforts related to the transaction. Notifications to affected employees in the Great Lakes Bay Region will start in the coming weeks, and will continue through the end of the third quarter of 2016. Roles will be eliminated on various timetables throughout the two-year integration period. Dow Announces Actions To Help Employees Work For Themselves, Yay! Can we just say for a moment how offensive it is that the press release can't even say "we're laying off 700 employees" or "we're firing 700 people", but "700 roles"? Corporate America has refined the euphemism to a Michelangelo-like artform. ...Our investigator randomly selected folder 01/2014 from your electronic log, compared it to your firm’s official deviation logbook for 2014, and found that the deviations in the “GMP Anomalies” folder were not investigated or reported in the official deviation logbook. In your response, you attribute the root cause of these failures to deficient procedures and operators’ errors. Pre-filled batch records! That's a new one. 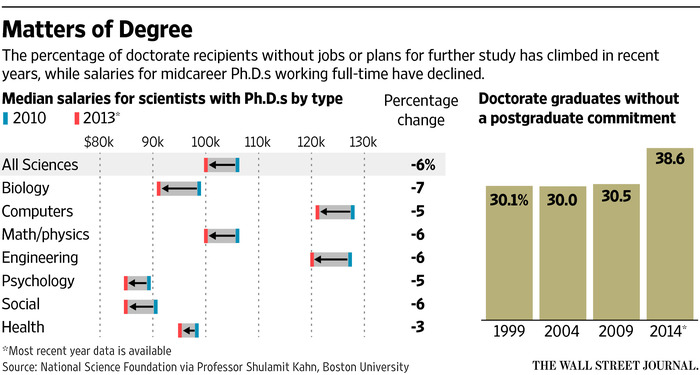 "A postdoc is highly valued." I find that so interesting. Ask CJ: what does "ABD" mean? Your latest Ivory Filter Flask post made me wonder: when "ABDs are encouraged to apply", does that imply that ABDs are in the process of finishing up...or, like in humanities, it's an alternate way out? I suspect that "ABDs are encouraged to apply" means "Just because you're still technically a graduate student and you haven't defended, you can still apply" and not "we don't mind if you don't finish your Ph.D. thesis and defend." That said, I've never sat on a small college faculty search committee, so I have no idea. Readers, what say you? Vancouver, BC: Xenon Pharmaceuticals is a startup looking for a B.S./M.S./Ph.D. medicinal chemist. 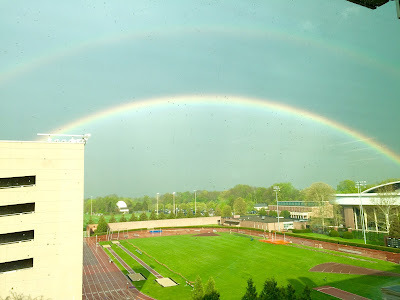 Albany, NY: The New York state Department of Health is looking for a Ph.D. atmospheric/physical chemist for a postdoctoral position: to study optical and reactive properties of water vapor of relevance to atmospheric radiation and cloud physics & chemistry." Urbana, IL: AOCS (mission: "to advance the science and technology of oils, fats, surfactants and related materials") is looking for a technical services specialist; looks to be an entry-level position? Los Alamos, NM: Two theoretical/computational postdocs at LANL; "annual starting salaries typically range from ~$73,600 to ~$87,700." Nice! Irvine, CA: The Department of Chemistry at the University of California, Irvine is looking for a mass spectrometry facility director. Austin, TX: UT-Austin is looking for a Ph.D. analytical chemist to be their undergraduate analytical laboratory coordinator. "The Biodesign Center for Single Molecular Biophysics is seeking a Research Technician. The candidate must have extensive experience in organic synthesis and be proficient in running multi-step reactions, purifying the products with chromatograph, as well as characterizing organic compounds with NMR and Mass spectroscopy (HR, MALDI, ESI mass)." Evidence of a Bachelor degree in organic chemistry. Evidence of a Master's degree in organic chemistry is preferred. Experience in bioconjugation and HPLC is a plus. Rochester, NY: Rochester Institute of Technology is looking for an assistant professor of chemical engineering. "Priority will be given to candidates with post-doctoral experience." Thuwal, Saudi Arabia: KAUST is looking for a B.S./M.S./Ph.D. QA/QC chemist to work in their new environmental analytical chemistry laboratory? "We are seeking a highly motivated individual for our new high-throughput analytical facility who specializes in the quality assurance/quality control of analytical data according to internationally accepted standards. He/she will preferably also engage in the analysis of trace organic contaminants (Example, Polycyclic Aromatic Hydrocarbons, Pesticides, Polychlorinated Biphenyls (PCB), Dioxins) in environmental samples using chromatographic and mass spectroscopic techniques." Little Lost Lamb: NYU Abu Dhabi is looking for a postdoc in "Traffic Flow Theory, Division of Engineering." This Mitch Jacoby piece on liquid metals (specifically gallium alloys) is really cool. Unexpectedly fascinating article by Alex Tullo on the decline of cellulose acetate sales due to declining cigarette sales. 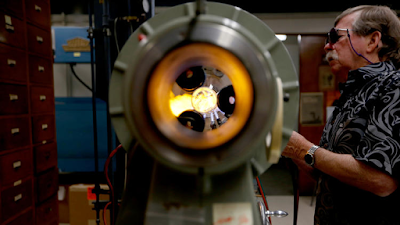 Interesting article in the Los Angeles Times (by Rosanna Xia) about Rick Gerhart, who is retiring at 71 after years of working as Caltech's chemistry department glassblower. For the U.K. pharmaceutical industry, a Brexit risks causing uncertainty and creating barriers to investment. “It’s vital the U.K. remains engaged in the EU to influence legislative and regulatory policy developments affecting the life sciences ecosystem,” says the BioIndustry Association, a U.K. industry organization. Ninety life sciences firms have stated publicly that the U.K. should stay in the EU. Additionally, if the U.K. votes to Brexit, two European pharmaceutical institutions currently based in London—the European Medicines Agency and a part of the EU’s planned unitary patent system—would have to relocate to an EU country. I believe the EMA is basically the EU's version of the FDA. The German pharma sector calling for them to leave (and relocate to Berlin?) already. I was also surprised to learn that good ol' Paul Hodges (Captain of the DOOOOOOOOOOOOOOOOOOM team) was actually voting Remain. Huh. I presume there are a raft of people who have Marie Curie Fellowships and the like, who may face some trouble? Readers, your thoughts? Full link to press release here and here. Background to the story here and here. C4 Therapeutics is seeking highly motivated and innovative medicinal chemists to contribute to the development of small molecule targeted therapeutics. Ideal candidates will have in depth knowledge of chemical synthesis and a proven track record of advancing small molecules across stage gates from Hit ID through clinical candidate selection. C4 Therapeutics is seeking highly motivated and innovative computational chemists to contribute to the conception and execution of innovative research projects that leverage chemistry, biology, structural biology, and computational science. West Point, PA: Merck, looking for an experienced Ph.D. analytical chemist for a principal scientist to do small molecule formulation development. Attleboro, MA: Sensata Technologies is looking for an experienced Ph.D. chemist to run their chemistry laboratory. Charleston, TN: Wacker is looking for a senior quality manager for its polysilicon plant; seems important. "Washington, D.C. or Chicago, IL": The American Institutes for Research are looking for scientists to write test questions, it appears. Huh: This program officer position at the National Academies seems really interesting; I could imagine doing some good here. Rolla, MO: Good ol' Brewer Science (are there any readers who have actually taken a position there? ); looking for M.S./Ph.D. polymer chemists, it appears. Another old friend: Clorox, doing its annual hiring push for research chemists. Pleasanton seems like a nice place. San Francisco, CA: UCSF is looking for a tenure-track nuclear chemistry (PET-related) position. Auburn, AL: Auburn, looking for a research assistant professor in quantum chemistry. Philadelphia, PA: Temple University is looking for a non-tenure track organic chemistry laboratory coordinator. Madison, WI: A biomedical engineering group is looking for two physical chemists to be postdoctoral fellows. Looks like it's going to be paying overtime, since the position is offering 43-45k. Last Minute Lecturer: Whitworth University (Spokane, WA) is looking for a lecturer in chemistry. Start date: August 1, 2016. M.S./ABD acceptable. I hear Spokane is nice; arid climate? Last Minute Lecturer #2: Wofford College (Spartanburg, SC) is searching for a one-year contract faculty position to teach general chemistry, to begin September 2016. Never too early for next year: The Claremont Colleges (the "Keck Science Department") is looking for a tenure-track professor of bioanalytical chemistry to begin in June 2017. UPDATE 22JUN16 4:38 PM: Science deputy editor Jake Yeston tweets it was a careless swapping of references by the production team at Science, not the authors. ...New ideas are needed for improving the public perception of scientists. What new solutions to this problem are possible? Past successes in engaging and influencing the public suggest employing television or movies to spotlight courageous acts of scientists working in their profession. A series of profiles of particularly courageous chemists, past or present, could constitute a 2017 ACS national meeting symposium. ACS members can contribute by sending nominations of scientists who risked their lives and careers in the course of their work to me at djnelson@ou.edu. When Nazi Germany occupied Denmark from April 1940, during World War II, de Hevesy dissolved the gold Nobel Prizes of Max von Laue and James Franck with aqua regia; it was illegal at the time to send gold out of the country, and had it been discovered that Laue and Franck had done so to prevent them from being stolen, they could have faced prosecution in Germany. He placed the resulting solution on a shelf in his laboratory at the Niels Bohr Institute. After the war, he returned to find the solution undisturbed and precipitated the gold out of the acid. The Nobel Society then recast the Nobel Prizes using the original gold. Would that I could be as quick with my mind as De Hevesy was - seems to me this little episode would make for a great caper film. Faster, scientists, do it, do it! One of the ways BASF intends to generate more without increasing spending is by conducting R&D faster. The firm plans to achieve this by, among other things, working more closely with academia and doing away with some lab experiments by first predicting outcomes with the use of computational chemistry. “In the future, we will need more computational chemists than lab technicians,” Brudermüller said. But BASF is also putting systems in place to ensure that creativity is not sacrificed in the drive for efficiency. For example, the firm recently started encouraging scientists within its central R&D organization to spend 20% of their time working on their own ideas, rather than solving problems for BASF’s businesses. “We call these ‘just do it’ projects,” said Bernhard von Vacano, senior research manager for material physics. Such projects might run for just a few weeks. But they are taken seriously, said von Vacano, who heads a team of materials scientists in a new R&D building in Ludwigshafen. In line with previously announced plans, BASF will maintain R&D personnel at its Ludwigshafen headquarters at the current level of about 4,900. Any increase in BASF’s worldwide R&D staff—which numbers about 10,000—will be in Asia. Not hiring any more R&D staff anywhere other than Asia. An interesting set of moves - will be interesting to see how this reflects on R&D chemist hiring by BASF in the US. I guess the over/under on descheduling marijuana is, what? 2020? I learned something reading Michael Torrice's article about nanoparticles and drug delivery. Doesn't anyone else think this seems like a really bad idea, in that weird sci-fi way? Linda Wang notes the 2015 listing of PRF grantees. Here is the direct link to the 2015 grantees. 2. I don't know whether to laugh or to cry about this advanced flask scraper from ChemGlass. Using these documents, Monroe is tracking how Aylsworth and his colleagues developed waxes and gaining a better understanding of the decisions behind the materials’ chemical design. For instance, in an early experiment, Aylsworth made a soap using sodium hydroxide and industrial stearic acid. At the time, industrial-grade stearic acid was a roughly 1:1 mixture of stearic acid and palmitic acid, two fatty acids that differ by two carbon atoms. That early soap was “almost perfection,” Aylsworth remarked in his notebook. But after a few days, the surface showed signs of crystallization and records made with it started sounding scratchy. So Aylsworth added aluminum to the mix and found the right combination of “the good, the bad, and the necessary” features of all the ingredients, Monroe explains. The mix of stearic acid and palmitic is soft, but too much of it makes for a weak wax. Adding sodium stearate adds some toughness, but it’s also responsible for the crystallization problem. The aluminum stearate prevents the sodium stearate from crystallizing while also adding some extra toughness. It would be interesting to take a look at the notes of early chemical formulators like Aylsworth to see how much chemical intuition/understanding they had, and how much was sheer trial-and-error. Tough day at the office for those LA firefighters. All median Ph.D. scientist salaries are trending lower from 2010 to 2013? Shulamit Kahn, a labor economist at Boston University, said that among foreigners who earn Ph.D.s at U.S. institutions—about one-third of total recipients—about 60% remain in America. A jump in the number of American women earning doctorates has also been a game-changer, she said. “Women were encouraged to become scientists, which is great, but the jobs haven’t kept up,” said Ms. Kahn. Ph.D.s still earn a significant premium over others in the labor market and their overall rate of unemployment remains low, though a growing number are taking jobs that don’t use their education. At the same time, their median incomes have been falling. Computer scientists earned $121,300 in 2013, down from $129,839 in 2008; engineers saw a drop to $120,000 from $125,511 and social scientists fell to $85,000 from $90,887. I presume this is data from the Survey of Doctoral Recipients, but I am not sure. I am surprised that Professor Kahn was able to get breakouts for math/physics data (I guess the chemists got lost?) Still, it doesn't seem to be good news that median salaries for Ph.D. scientists have been trending lower against inflation. *Can't get past the paywall? Google search "Job-Seeking Ph.D. Holders Look to Life Outside School." A tough week for posting on the blog, for which I am sad. Better luck tomorrow, or next week. We are seeking a hands-on analytical chemist experienced in quantitative and qualitative analysis of botanical extracts, dietary supplement ingredients, and foods. This position will play a key role in the production and analysis of functional foods infused with cannabis and other botanicals and nutraceuticals. This scientist shall add value by continually evaluating our manufacturing operations with the goal of implementing new and improved processes and bringing new products to the market. The ideal candidate will have at least three years of applicable cannabis, food, or pharmaceutical experience with a focus on ensuring product quality, safety, and satisfaction. Must possess high attention to detail, strong organization skills, and excellent communication. Will operate in a safe, detailed, and accurate manner. He/she will need to operate in a startup environment and be flexible to take on new and added responsibilities per the business’ growth needs. LC/MS experience, B.S. in chemistry desired. Full ad here. Best wishes to those interested. Last Aug. 17, Jason Chan started his job as a director of biostatistics at a small biotech called Akebia Therapeutics. Just two days later, he began buying Akebia stock based on information he learned about study results for a key drug while attending meetings. Within days, his wife and a friend to whom he owed money also began buying shares. The US Department of Justice charged Chan on Tuesday with securities fraud. And the US Securities and Exchange Commission filed a lawsuit against Chan alleging insider trading and wants him to return $68,000 in illegal profits as part of a scheme that netted his wife $115,000 and the friend another $105,000, according to the lawsuit, which was filed Tuesday in federal court in Boston. Maybe I am completely naive and fooled and the SEC can barely catch all the people who are insider trading, but it sure seems like a whole lot of people get caught doing that. What are they thinking?!?! Riddle me this: Why has Cyalume Technologies (West Springfield, MA) been looking for a research chemist for ~3-4 years now? As I have thought this entire time, the job looks interesting for somebody? Wenatchee, WA: AgroFresh (late of Dow, yes?) is looking for a M.S./Ph.D. analytical chemist. North Charleston, SC: Ingevity (used to be MeadWestvaco, looks like) is looking for an experienced analytical chemist. Cary, NC (? ): The National Council for Air and Stream Improvement is a forest products trade organization; they're looking for a principal scientist to track "emerging health effects, epidemiology, and exposure assessment studies for substances relevant to the forest products industry, including fine particulate matter, ozone, metals, and other substances regulated in air, water, and soils." Bet you'll be popular. Tarrytown, NY: ARMGO Pharma is looking for a M.S./Ph.D. analytical chemist. Laurel, MD: FDA is searching for a research chemist; you'll be "experience[d] conducting research in analytical chemistry method development and validation for use in pharmacokinetic/toxicokinetic studies and developing analytical methods utilizing mass spectrometry, high pressure liquid chromatography (HPLC), and gas chromatography." Looks like a 2-year position, with possible extensions? Pay is decent-ish? at 92,145.00 - 119,794.00. And the waitress is practicing politics: I don't know why I think of "Piano Man" when I see a PharmAgra Labs ad at C&EN Jobs, but I do. Gainesville, FL: The University of Florida is searching for a laboratory lecturer for classes in physical, biophysical and analytical chemistry. Pensacola, FL: Pensacola State College is looking for a M.S. chemist to be a chemistry/biology instructor. Offered salary: 34,828.00 - 40,828.00. Starts in August 2016. Imagination wanted: The International Institute of Nano and Molecular Medicine at the University of Missouri (Columbia, MO) is looking for postdoctoral fellows. 40-50k offered, looking for "A PhD in Chemistry, with laboratory experience in chemical synthesis and imagination." Huh. Northampton, MA: Smith College's David J. Gorin is looking for a postdoctoral fellow. Maastricht, NL: Maastricht University is looking for a lecturer in chemistry; it's a two year contract. Providence, RI: Providence College is searching for a visiting assistant professor of organic chemistry. Hillsboro, KS: Tabor College is looking for a 1-year visiting assistant professor of chemistry, starting August 2016. Seems to me this is Last Minute Lecturer territory! 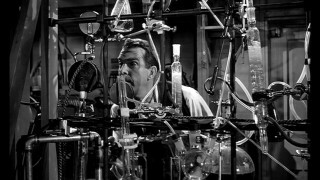 It's funny to think that HPLC was once a technology that had an infancy, or that people needed to convince folks to try it out. Interesting article by Marc Reisch about the "Moore's Law" of HPLC columns. Acetate in the gut affects feeding behavior in mice? I personally think that "tennessine" is a fitting tribute to the Volunteer State. I don't claim to understand Brexit, but Alex Scott has a round-up of UK/EU chemical industry opinions on the matter. When Lillie and other Moses Lake engineers met with their ASL colleagues in December 1998 to review a new design using ammonium nitrate, Lillie says they were told the phase stability problem had been solved. He rejected the design nonetheless. ASL wasn’t able to provide documented evidence of the safety of its product, he said in a January 2016 deposition, taken as part of a personal injury suit against Takata and Honda. “Never any evidence, never any test results, never any test reports, nothing to substantiate they had overcome the phase stability problem,” Lillie testified. Sadly, the bosses at Takata ignored the bad news, and pushed forward. I hope to never be in the situation at the Takata engineers found themselves in, and if I do, I hope I have the courage to speak out. Just for fun, you should check out this paper, and its Supporting Information. It seems... not quite right. "If I had to do it all over again, I’d do it exactly the same way." Charting a new path: Dietze was not offered tenure at UMBC (CJ's note: this happened in 1993) so he applied to law school, an idea he had toyed with early on. Dietze worked as a review chemist for the U.S. Food & Drug Administration and attended the University of Maryland School of Law in the evenings. He earned his law degree in 1998. Then, somehow, over a period of eighteen months, he had gotten clean, and stayed clean. A lot of him was gone. He was no longer the driving wheel of any group, Most Likely to Succeed or otherwise, but he was always on time, never missed a practice session, or f---ed up an audition. He didn't talk much, but the needle highway on his left arm had disappeared. And Barry Grieg had said: He's come out the other side. That was all. No one can tell what goes on in between the person you were and the person you become. No one can chart that blue and lonely section of hell. There are no maps of the change. You just... come out the other side. I can't imagine what it is like to be an assistant professor and not be offered tenure, but I imagine that it is a devastating blow. I'm glad that Dr. Dietze came out the other side. And I think that's because these issues touch everyone because they deal with our health. Everyone knows someone who got cancer at an early age or who wasn't able to conceive a child. And chemical exposures are increasingly linked to those problems, so I think what everybody felt it was time to upgrade this law. In an irritable moment, I'll usually make an unfair generalization that 'the environmentalist is the natural enemy of the chemist. '* To suggest that childhood cancers and modern infertility issues are caused by "increasingly linked to" chemical exposure in the environment is a statement that 1) I suspect doesn't have much causal backing in the literature and 2) a strong accusation that will stick in the hearts and minds of the public. As long as folks like Dr. Denison keep making these statements, I'll keep thinking I'm mostly right. *Update: I should probably narrow that to "synthetic** chemist." **Defined broadly, as in "those who make new molecules/formulations"
Also, Blum says, chemistry is tied to environmental risk in a way that most other sciences are not. “I do think you have to be honest about that.” Nevertheless, she says, we can’t ignore chemistry just because it has inherent risks. It’s not so much that we have to admire every aspect of chemistry, Blum explains, but it’s important to recognize that chemistry is fundamental to the way we navigate the world. “I’m not trying to sell chemistry,” Blum continues. As a journalist, she says, that’s not her job. Rather, she sees it as her responsibility to share her fascination with chemistry. 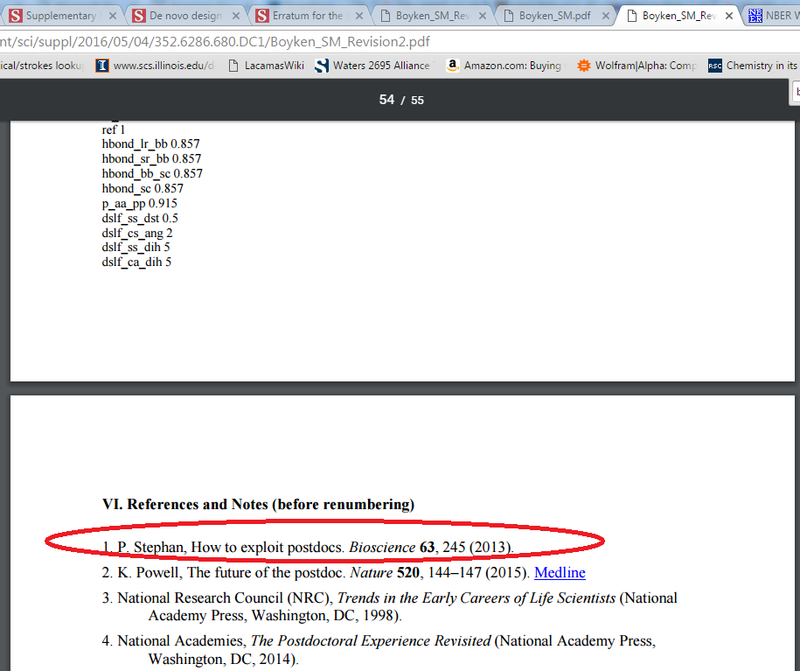 Sometimes that means highlighting when and how the science has gone wrong. Deborah Blum points to something that is really true about chemistry; industrial chemistry has a legacy that is often less than positive, and it's difficult to give a sense of optimism about chemistry when the likeliest question that you get from folks is "is this stuff gonna kill me?" or "isn't there a natural way to fertilize our crops/cure our diseases/power our society?" I agree with her that chemistry is fundamental to modern life - and maybe that's part of the problem? So many people are ambivalent about the trade-offs that are inherent to our modern, chemistry-powered life. Perhaps there is an aspect of escapism to physics (and maybe biology?) - that's just something that most chemical research just doesn't have. Living Proof is seeking a Research Scientist to support Discovery activities for new product development in hair care. The Research Scientist will contribute to the innovation pipeline and be responsible for designing and developing new materials for hair care applications from concept through product launch. The Research Scientist will play a key role in a multidisciplinary team of scientist, and identify materials performance design targets through collaborations with Discovery team scientists, and industry experts to address unmet consumer needs. This position will report to the Director of Research. This is a paid, full time, position based in Cambridge MA. Full link for this Ph.D.-level position here (scroll down). Also, a temporary M.S./Ph.D. 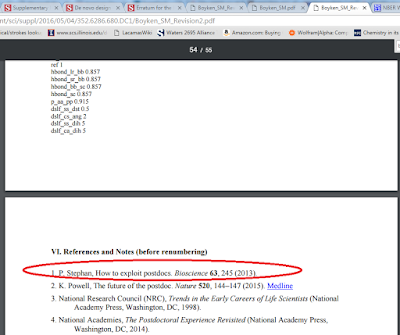 research position, also with Living Proof (link here). "I’d settle for a “THX BUT NO THX HAVE A NICE LIFE” text"
Solving the problem of non-rejection rejections would be a good start to civility in job applications. *there isn't some sort of notation that I'm not familiar with, is there? Whiskey made in steel tanks? Having lived in the Kentucky area for more than 20 years, I have tasted many types of bourbon whiskey, from the low-cost Jim Beam to the middle-level Maker’s Mark and Woodford Reserve. On a recent visit to the Rock & Roll Hall of Fame & Museum, I was served Cleveland Whiskey, which was covered in a recent Newscripts (C&EN, May 2, page 40). The flavor imparted was harsh and biting, with none of the smoky smoothness that comes from aging. Perhaps chemicals used during the bourbon whiskey’s aging process are getting into the spirit, because its makers have missed something during their analysis. When chemists evaluate alternate sources of raw materials, it is not usually the major components that provide the issue, but it is frequently a difference in a small residual material that is there or not there. Cleveland Whiskey still has a long way to go to achieve a drinkable basic bourbon whiskey. Maybe it will be better off competing with specialty niche products that cannot be compared to the smooth amber flavor of a well-aged bourbon. Interesting article by Alex Tullo on efforts to find a replacement for a problematic polyurethane curative 4,4´-methylenebis 2-chloroaniline, or MOCA. Melissae Fellet writes on diesel engines, NOx and catalysts. Fair number of letters to the editor this week. I am so happy to see that Materia is still writing on its blog All Things Metathesis; good post on tandem ruthenium catalysis by Philip Wheeler. The latest from The Collapsed Wavefunction podcast on cholecalciferol. John is back to posting regularly at It's the Rheo Thing - good stuff. Good post about glyphosate by Kat Day. Loved this letter by Hans Bethe about America, courtesy of Ash. The latest from the Baran group. Th'Gaussling asks "how shall we train chemists to handle chemicals?" The View from Your Hood: nice rainbow! An anonymous submission from the Princeton chemistry department. Eleven ways to say "accidentally" without saying "accidentally"
I suspect most experiments in the Brainerd Group happened serendipitously. During our studies on conjugated D-A polymers with positively charged moieties in the side chains, we accidently discovered that incorporation of ammonium salts into certain conjugated D-A polymers can improve the interchain packing order and enhance their charge carrier mobilities. Congratulations to Luo et al. ; sounds like an interesting project. NEVER thaw frozen acrylic acid with steam! NEVER remove acrylic acid liquid from a partially thawed container! NEVER allow an incompatible material (peroxide, peroxide former, inhibitor or oxygen scavenger, strong bases, mineral acids, or iron oxide/rust) to come in contact with GAA or Acrylate Esters! NEVER sparge Nitrogen through MEHQ inhibited GAA or Acrylate Esters! NEVER blanket MEHQ inhibited GAA or Acrylate Ester tanks with Nitrogen! NEVER store MEHQ inhibited Acrylate Esters above 104 F (40 C)! NEVER store MEHQ inhibited GAA above 90 F (32C)! NEVER deadhead pumps containing MEHQ inhibited GAA or Acrylate Esters! NEVER use steam to heat Acrylate Esters or GAA in storage! NEVER store MEHQ inhibited GAA or Acrylate Esters beyond the 1 year shelf life! Re-inhibiting with MEHQ and sparging with Oxygen will not extend the life! It's funny to me how safety literature is mostly of the "polite suggestions" variety, with strong words ("always", "never") reserved for material that has some pretty remarkable consequences. Considering that a random Googling of acrylate accidents reveals quite a few of them (including a plant explosion in Georgia that injured 6 and killed 1), following the 10 "NEVER"s seems like a good idea.